"10. SUTRO BATHS. INTERIOR LOOKING NORTH." 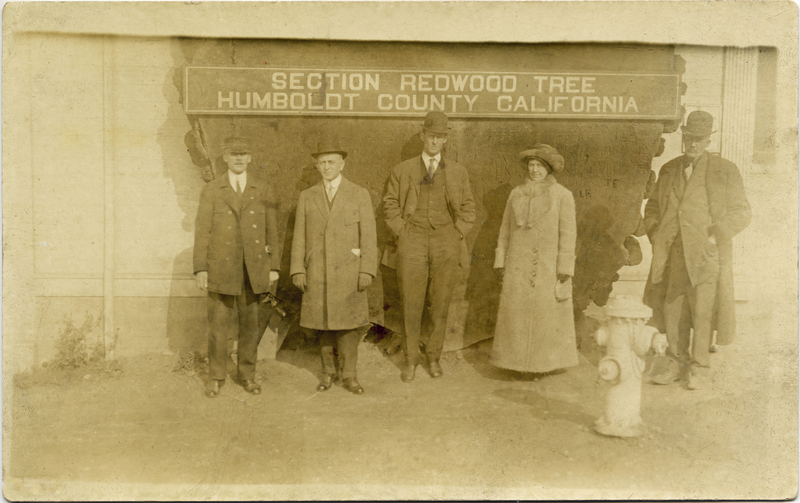 "SECTION REDWOOD TREE, HUMBOLDT COUNTY CALIFORNIA"
"107 Sutro Baths interior, looking east, San Francisco, Cal. 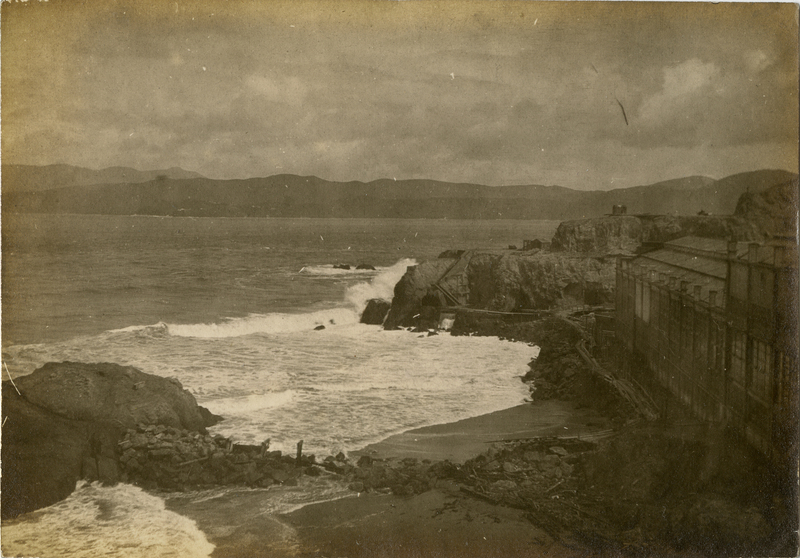 W.C. Billington, Photographer"
"Sutro Baths, looking east, May 1, 1896"
"Sutro Baths Interior, looking south. 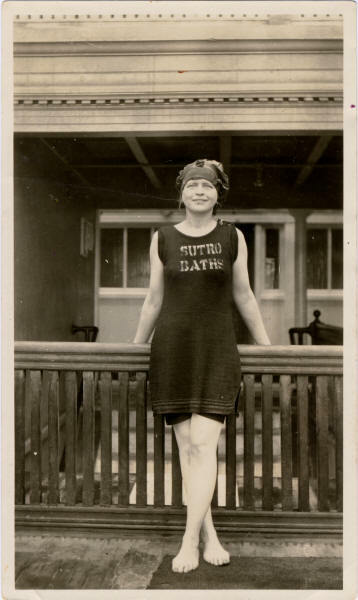 May 1, 1897 W.C. Billington, Photographer"
"In the Great Sutro Baths, San Francisco, California, U.S.A. 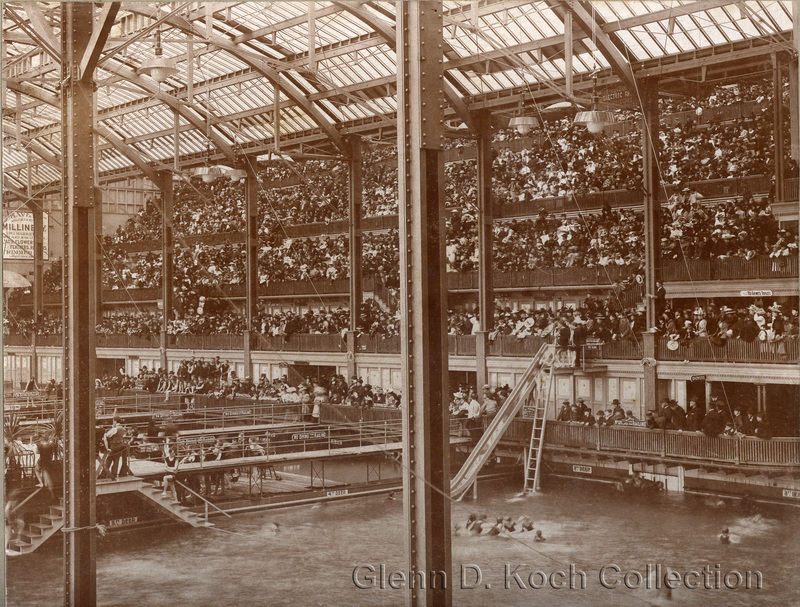 Copyright 1898 by Strohmeyer & Wyman"
Interior Sutro Baths, San Francisco, U.S.A. 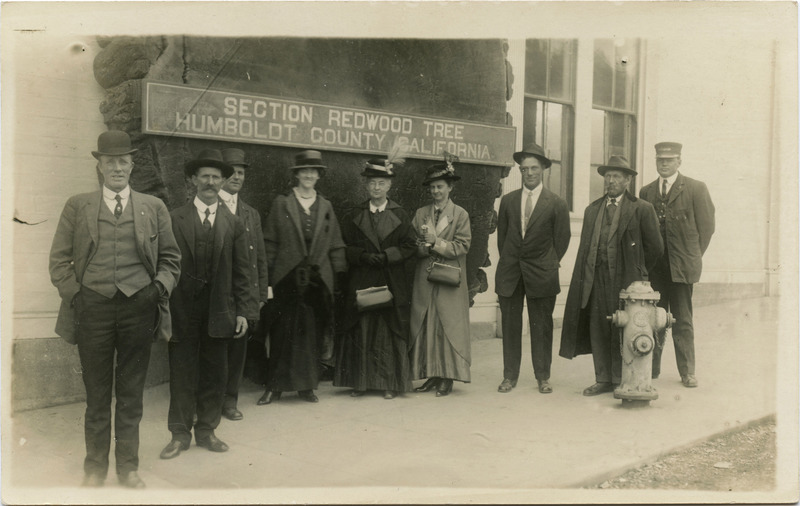 COPYRIGHT 1908 BY J. J. KILLELEA & CO. 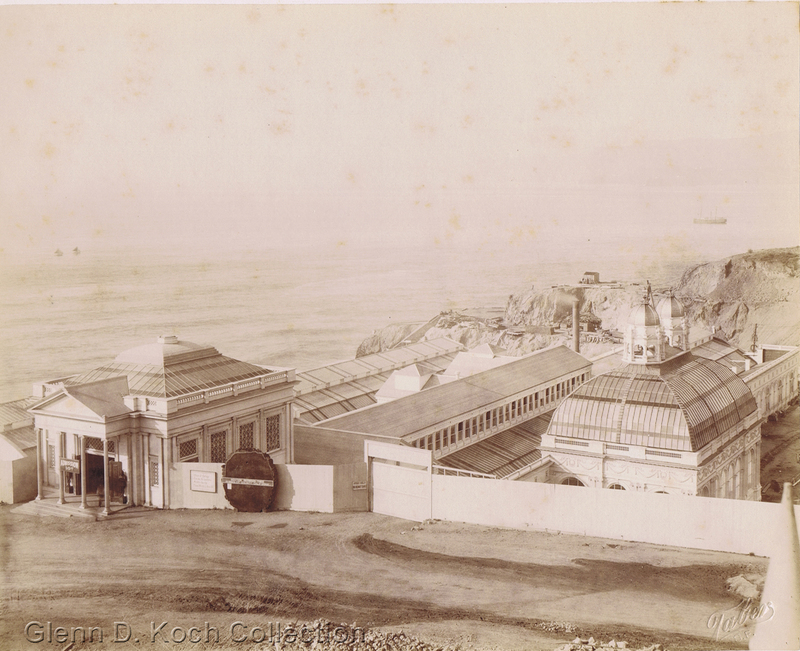 Entrance to Museum, Sutro Baths, San Francisco, U.S.A.
Click above image for ultra-high resolution....can you spot someone doing a handstand? Estimated date: 1910. 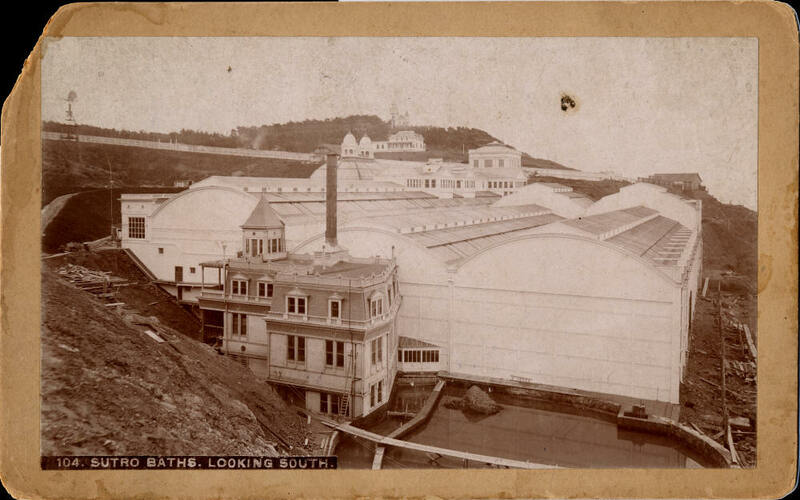 I was reviewing the construction photos and noticed something curious; the below views indicate that part of the bathhouse building was actually demolished during construction. 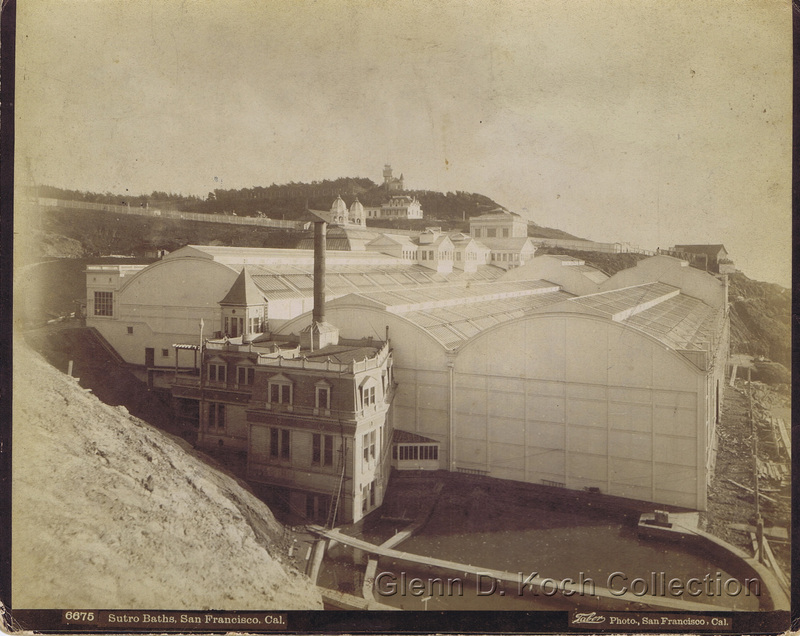 The first photo shows construction sometime in January-February 1893. 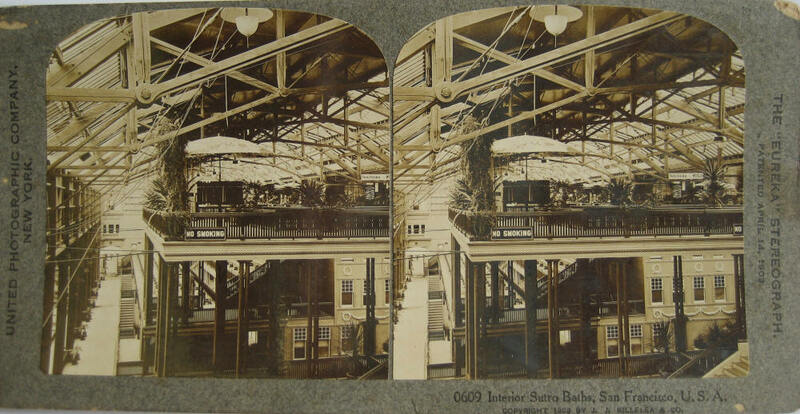 (The rising columns and trusses help date these images.) Notice the circled area in the vicinity of the future Grand Staircase. "Based on my study of the SF Library plans the construction shown in the first photo follows the original plans. 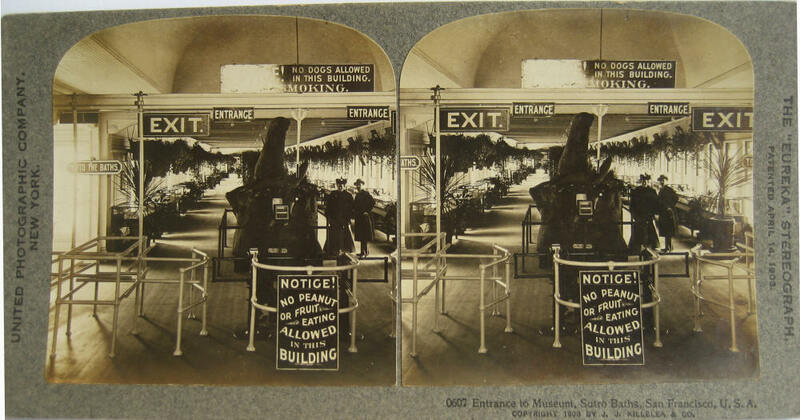 There were to be two "Towers," one each side of the grand stair case. Each with an elevator. Your first photo shows the beginning of the northern tower. I think what probably happened is that they realized the "towers" blocked the views from the grandstands. So they demolished the western portion and left it open with just columns. Only one elevator was constructed and it was an open cage running on vertical rails. 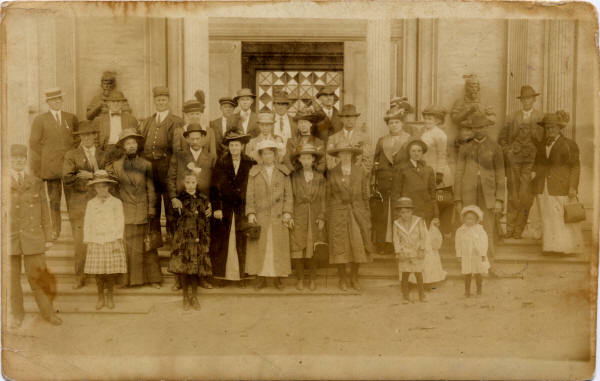 The eastern portion of the structure then became the windowed structure you see in the photos of the grand staircase. 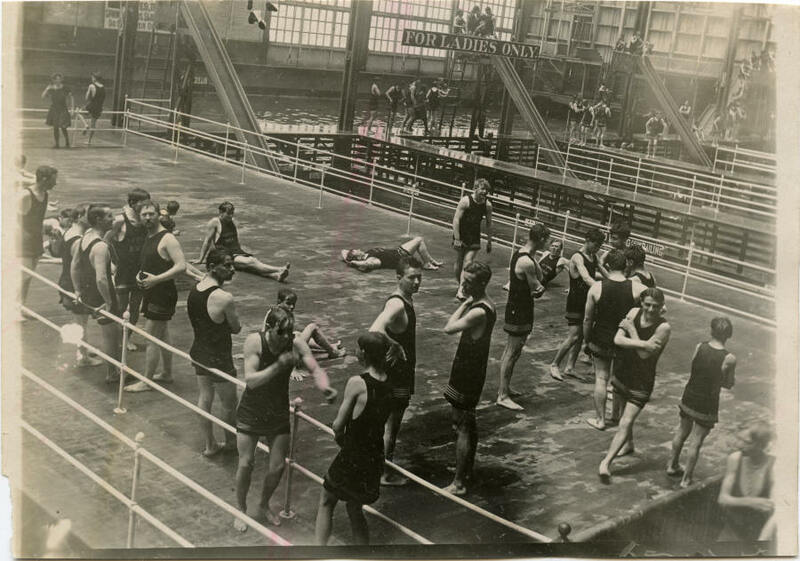 The funny thing is that the roof of the baths was constructed to accommodate both elevators even though only one was built. 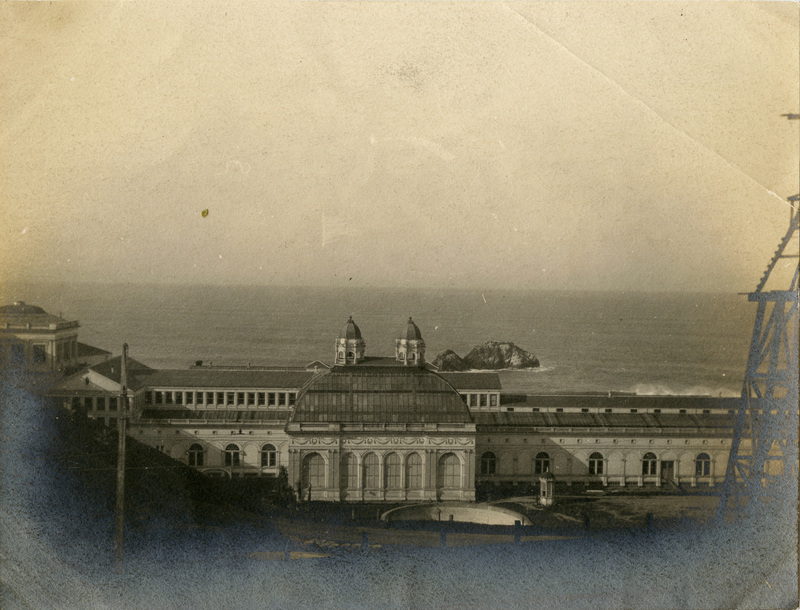 Reverse: "Taken at the Cliff House on our 3 hrs trip seeing San Francisco, Sept 1, 1913"
Dave D's recollections: "I was born in San Francisco in 1952 and remember visiting the Museum and Ice Rink. 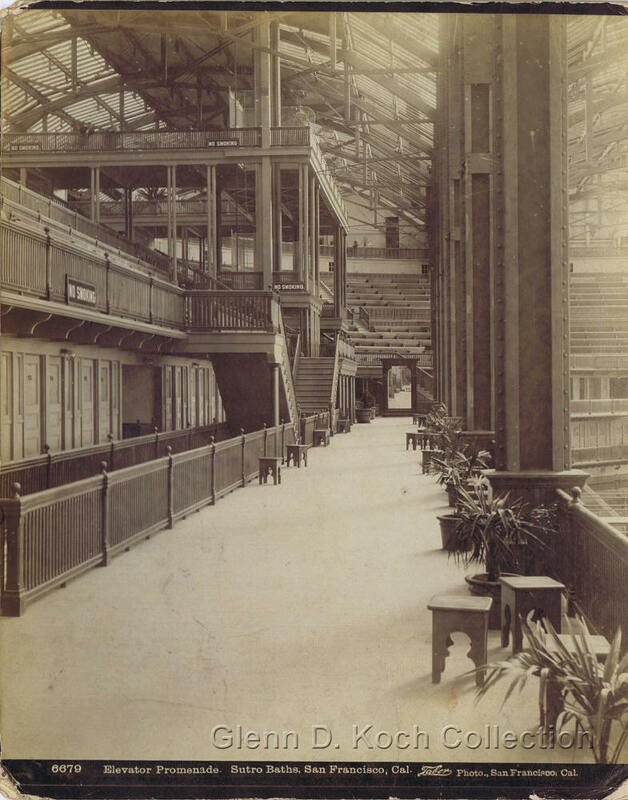 As you descended the entry stairway towards the museum a left turn brought you to the ice rink entry stairwell. Just before reaching the stairwell there was a wooden case in the middle of the hallway about three feet tall and about three foot square. On top was a clear piece of glass that one could peer into and through a series of mirrors was able to look down a series of shafts that afforded a view of the ice rink from three floors above. 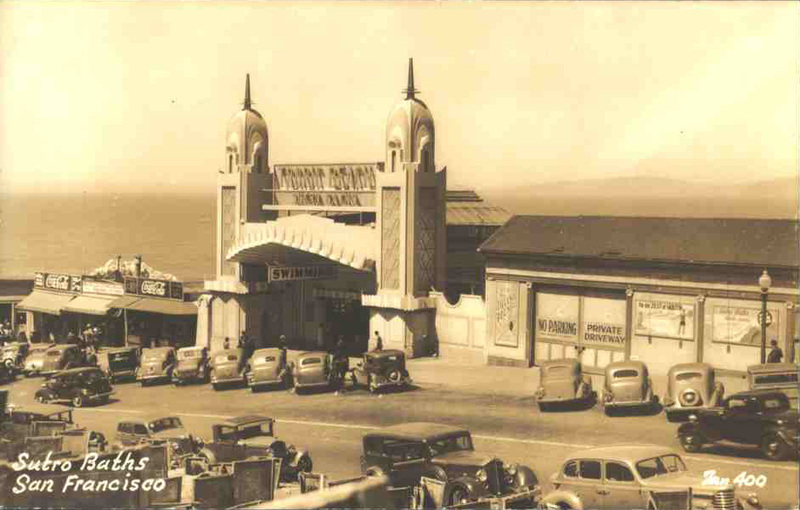 I believe that the upper restaurant area at this time (in the early 1960's) was used for coin operated binoculars focused on Seal Rocks. The rear glass wall of the ice rink that was the separation from the old baths had a hand painted winter village scene across the entire wall. 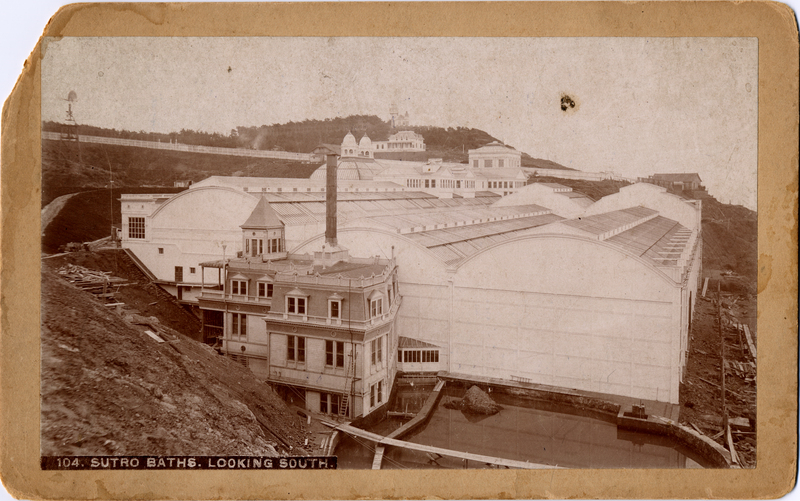 Kids would scratch off the paint to create peep holes for a view of the creepy old (haunted) baths. 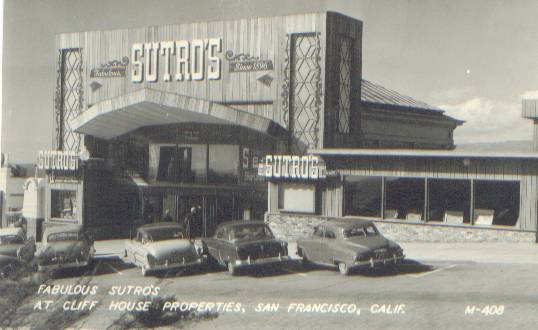 I've read that many of the curiosities purchased by Sutro came from Woodward's Gardens. 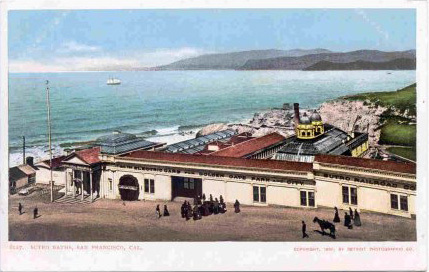 The Baths were already closed when I was a boy but the Sutro Museum and Ice Skating Rink were still running. I had just turned 14 years old in 1966 when Sutros was lost to fire. 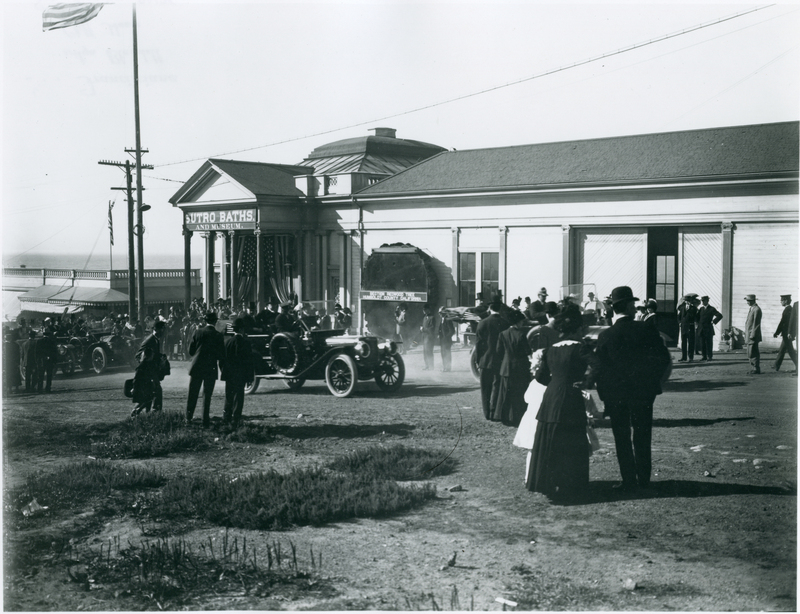 The column of smoke drifted south over the Sunset district and headed south for Pacifica. It burned for three days. 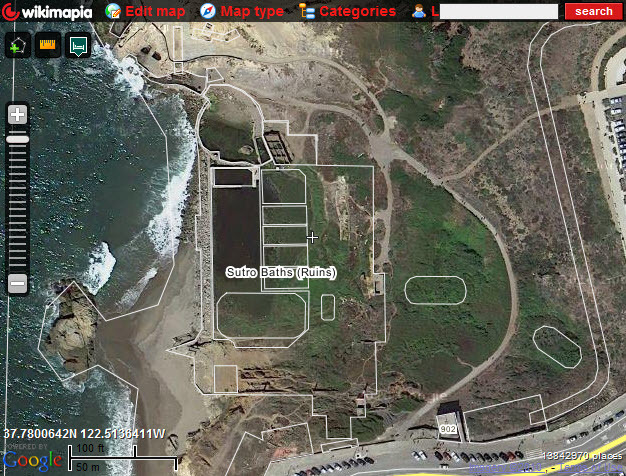 On the morning of the fourth day curiosity got the better of me, so my friend and I boarded an 18 Sloat and walked up the hill from Playland. The pit was still smoldering and yellow police tape was still surrounding the perimeter. Down below the tape was an old Sutro office cement vault room with the door open. Under the tape and down the hill we went. Inside the vault room was an 1800's hand painted safe about 5 feet tall and with the doors opened. 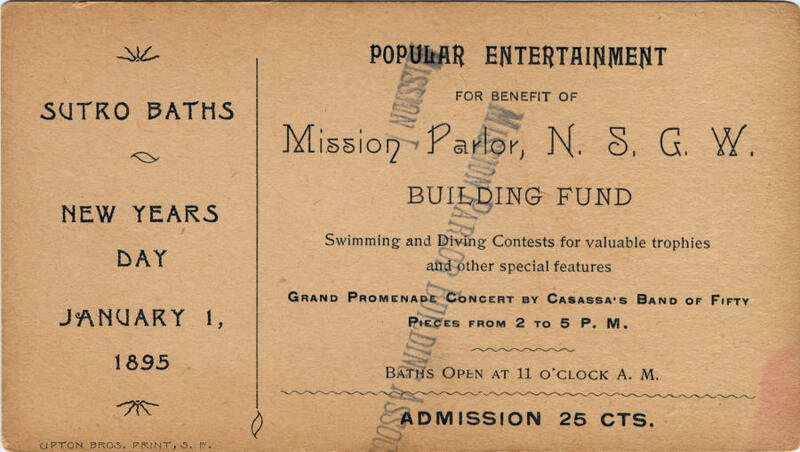 it was empty of course except for a small box of Sutro Bath Admission tickets. 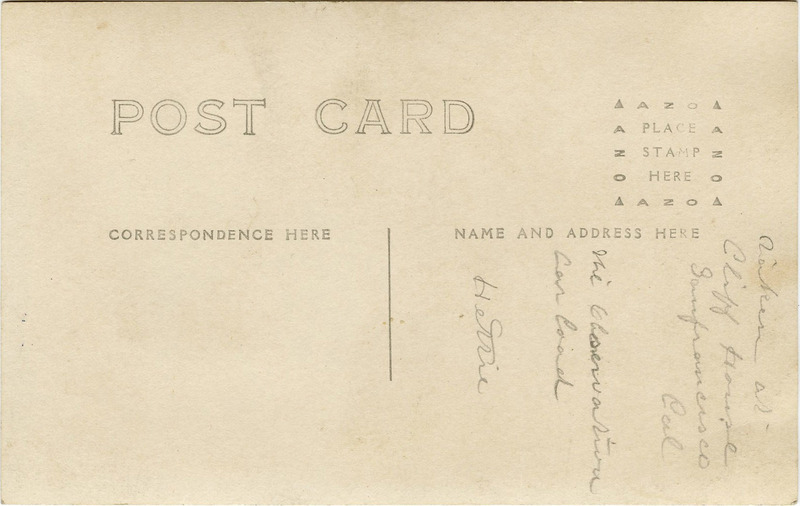 The tickets were in decent shape considering the inferno they survived." Similar view to previous photo. 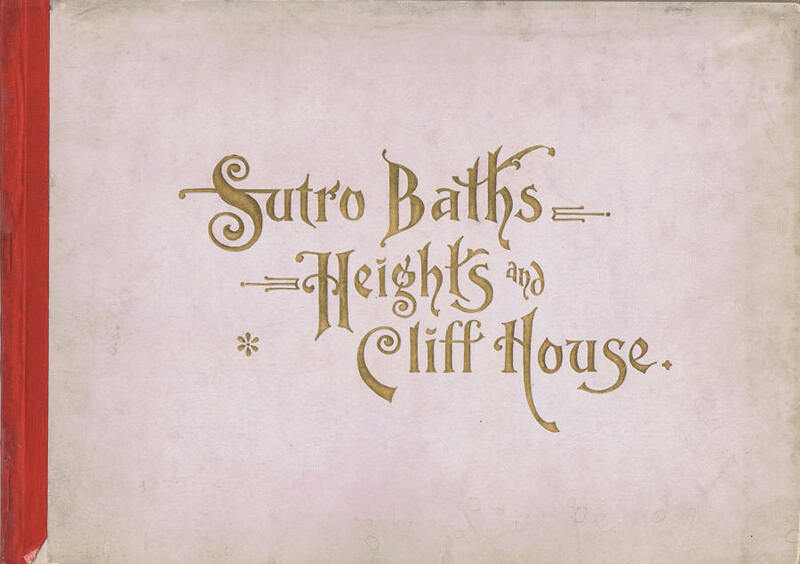 Caption: "Sea from the Cliff House Nov 20 20"
Sutro Baths letterhead / letter, 1935, 8 1/2" x 11"
The Sutro baths and casino out on the beach, just north of Sutro Heights, are rapidly nearing completion. It is only a matter of weeks now—and not so many of them either—before the mammoth establishment will be thrown open to the public. If the work be rushed it can all be finished in a little over a month's time, and the present orders are to "rush." When it is completed San Francisco will have an institution of which she maybe justly proud. 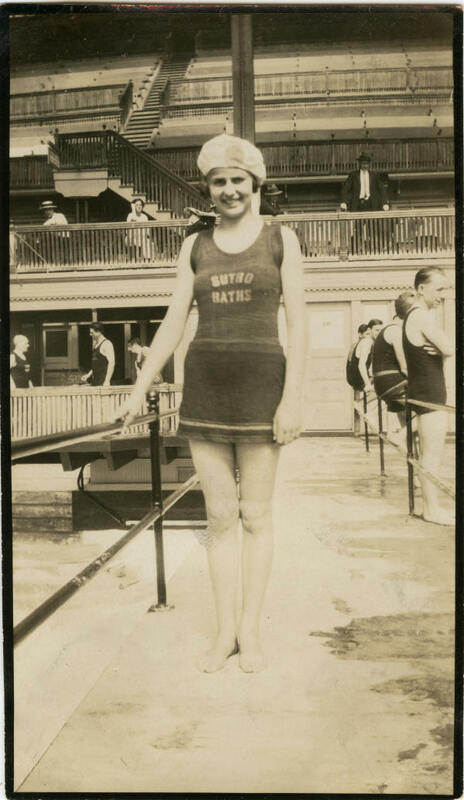 There is no bathing establishment in this country as large, as complete, as convenient or as luxuriously appointed. 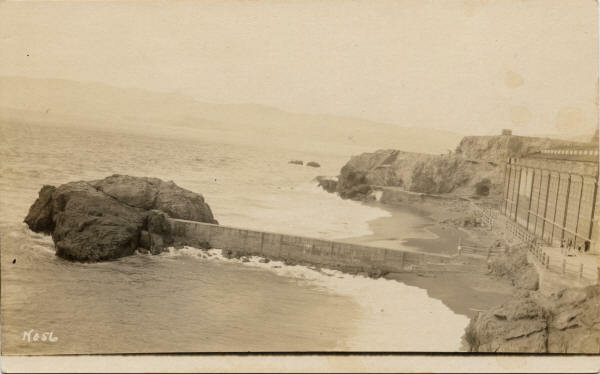 Once there was a huge depression on the north side of the road that runs to Sutro Heights, and In the depression or gully was a sea of sand, and rock, and seaweed and spray, and the gulls went there to roost. "That will always remain a wild and barren place," people said. Now they see how mistaken they were. The gully is still there, but in the place of its jagged rocks and sand dunes is a huge concrete reservoir or series of reservoirs; and rising high over these long reservoirs is a bewildering mass of green iron and wood frame work. Soon many hundreds of tons of glass will be covered over this frame work. 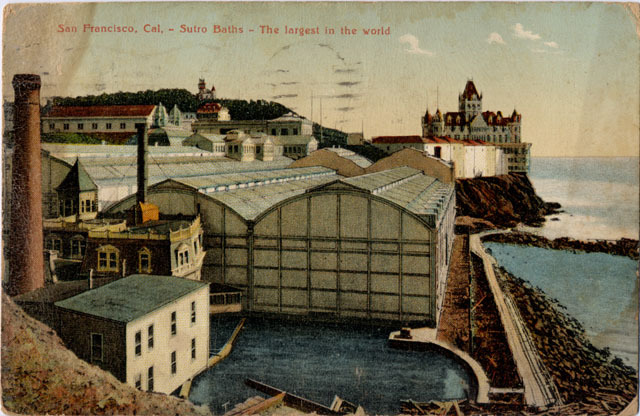 Then the Sutro baths and casino will be enclosed, and one of the most desolate and forlorn spots in the world will have been converted into one of the finest structures in the world—if not the finest. Inside these green, glass-covered walls there will he an amphitheater capable of seating 5000 people comfortably; there will be a stage appointed with all necessary scenic effects; there will be private bathing lockers to accommodate 400 bathers at a time, clubrooms for bathers which will give room for 1000 persons at a time, booths, promenades, opera chairs, smoking-rooms, theater, dining-rooms, luncheon parlors, elevators to the observatory on top of the structure, conservatories and six mammoth swimming tanks, not to mention tub baths and baths of all kinds, toilet-rooms, waiting-rooms and every convenience and luxury that one could dream of or unlimited money provide. 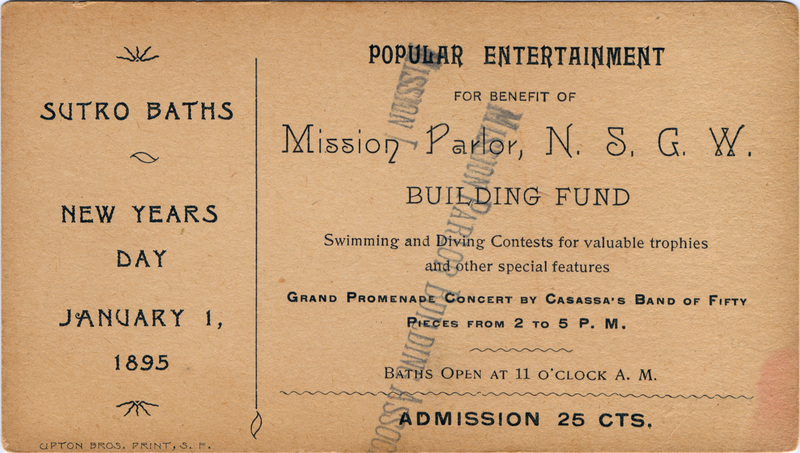 Here all manner of aquatic entertainments will be provided. Sham naval battles will be held. 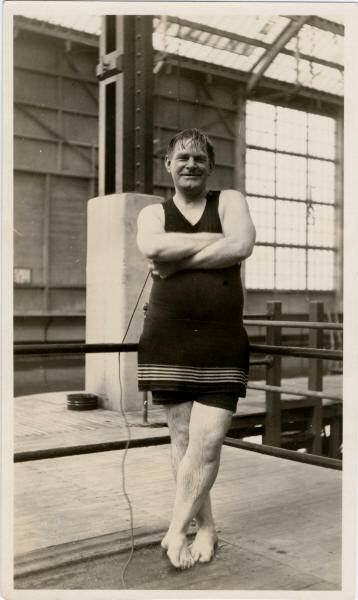 There will be trapezes without number, springboards galore, and all the athletic appointments that can possibly be employed in aquatic sports. The entire surface of salt water under cover will be 300 feet in length by 150 feet wide. This will be divided into six compartments, or separate tanks. 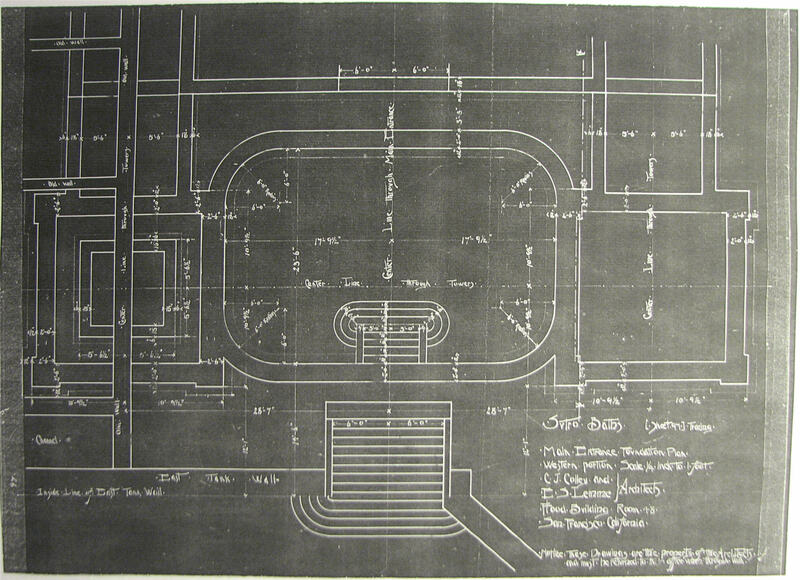 The main tank will be shaped like an L, the perpendicular stroke of the letter representing the entire length of 300 feet, and the horizontal stroke stretching the entire width, or 150 feet. On the inside of the L there will be five smaller tanks. Two of these will be 28 by 75 feet each in surface measurement, and the fifth tank will measure 50 by 75 feet. 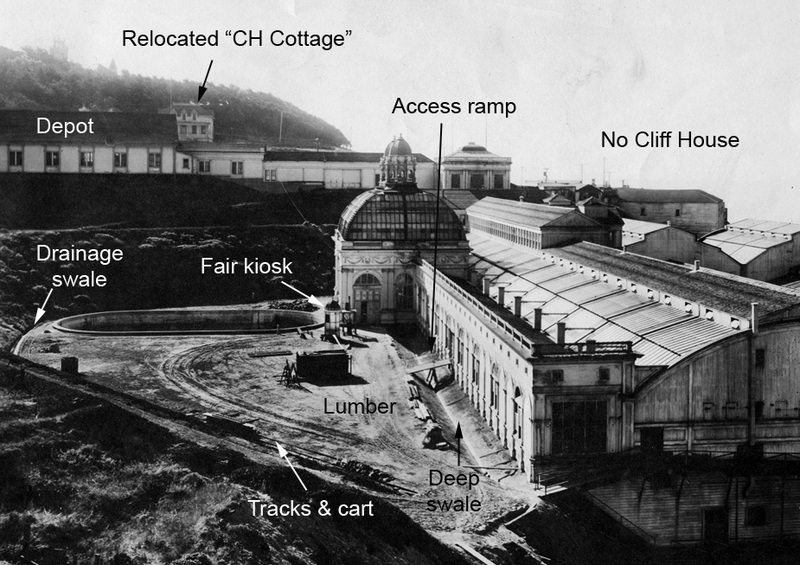 The main entrance to the baths and casino will be located at the southeast corner of the structure. This will be quite an elaborate piece of work, the architects, Messrs. Lemme and Colley, having put in their brightest bits of ornamentation on the plans. 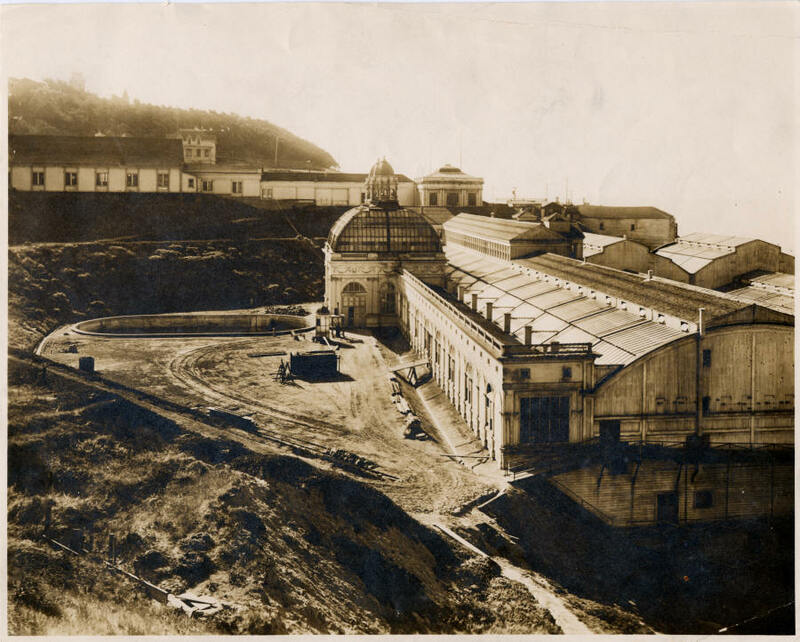 Flanking both sides of the main entrance to the west are two large passenger elevators, running from the observatory and promenade on the roof, seventy-six feet above, to the lowermost tier of dressing-rooms, which are on a level with the reservoirs. Four flights of stairways, wide and easy of ascent, lead from the booths and promenades on the top floor to the Mower bathrooms, and on each side of the stairways are terraces, which will soon be ornamented with flowers and shrubbery. 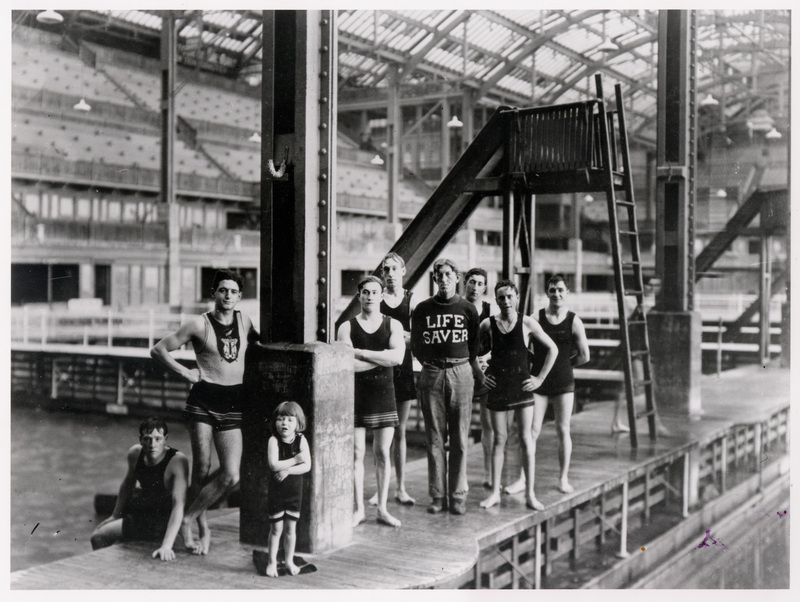 The dressing-rooms run in a semi-circle about the bathing tanks, and are built in tiers, rising one above the other. Over these dressing-rooms is the amphitheater. At the bottom of this amphitheater, which begins on top of the first tier of dressing-rooms, is a 14-foot promenade, running clear around the amphitheater, and connecting with the four main stairways. At the top of the amphitheater, running clear around, is a platform thirty-six feet in width, which adjoins the esplanade, and leads thereto by many entrances. The esplanade skirts the outside of the entire structure, offering on the western side a magnificent view of the ocean and the rockbound coast below. 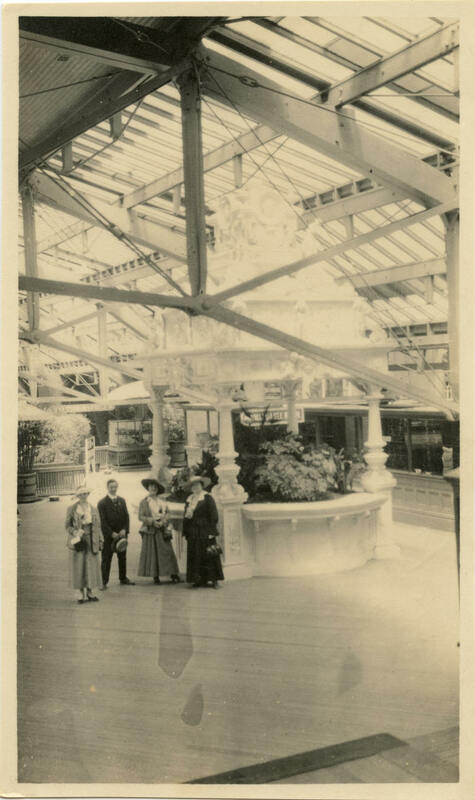 On this platform will be the booths of all kinds, for edible and liquid refreshments, for the sale of sea-shells, photographs and souvenirs for travelers and whatnot. In front of the booths will be another promenade or dancing pavilion, or casino with tables and chairs, where one may sit and see all that is going on in the entire building. Nearly three acres will be under cover of this great green structure, and when it is all completed it will form one of the great attractions of this city. Midwinter Fair tourists and visitors will find in it something they have found nowhere else in their travels—an immense and luxuriously appointed bathing and swimming establishment, combined with a theater, cafe and casino. 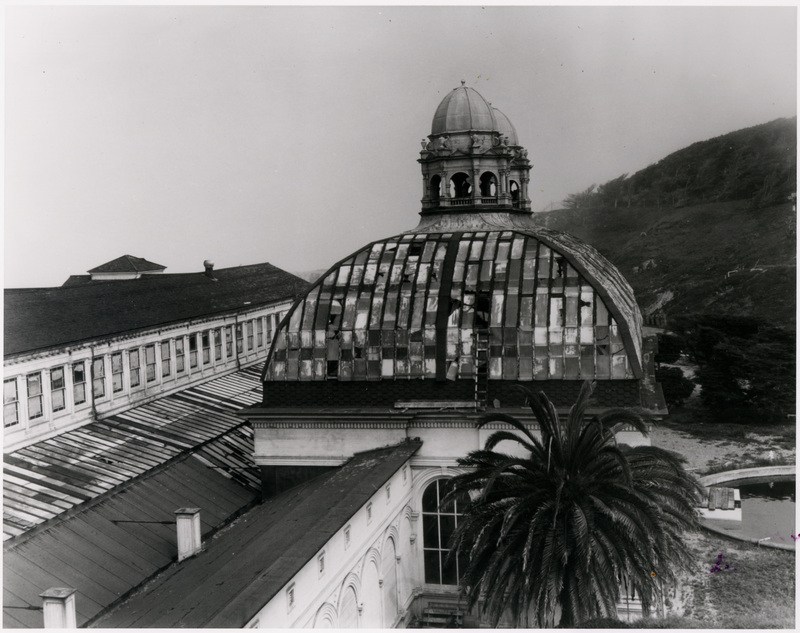 This is allegedly a pane of glass from the roof of the Sutro Baths. Click here for more views. For more information on the Sutro Baths I highly recommend John Martini's definitive reference, "Sutro's Glass Palace: The Story of Sutro Baths". His meticulous attention to detail is unmatched and the 3D illustrations are superb. I've known John for many years and neither this page, nor the entire website for that matter, would be half of what it is without his patient help.